Ceramic artist Warren Mackenzie shapes clay into simple, functional pieces, as he's done for more than 60 years. We spend an afternoon with Mackenzie in his Stillwater studio as he fires pots and prepares for an exhibition in New York. Ceramic artist Warren Mackenzie shapes clay into simple, functional pieces, as he's done for more than 60 years. We spend an afternoon with Mackenzie in his Stillwater studio as he fires pots and prepares for an exhibition in New York. Artist Bio: Someone once told potter Warren MacKenzie that the first 10,000 pots you throw are difficult. After that, it gets a little easier. 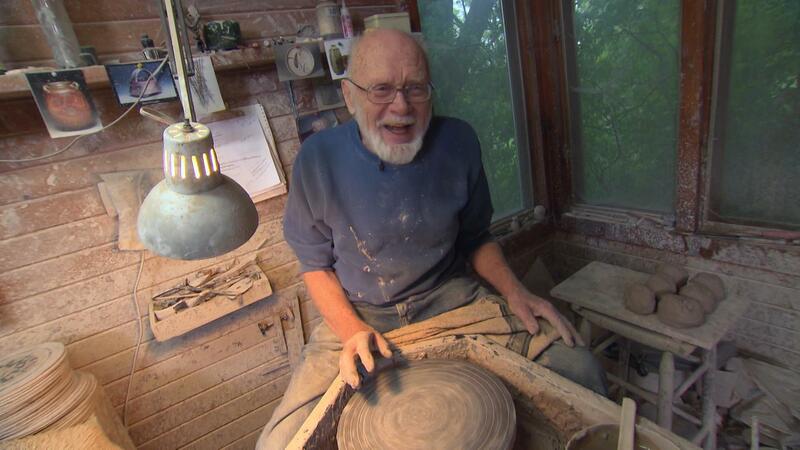 Watching him in his Stillwater studio, one would think he could throw pots in his sleep-he makes it look that easy. MacKenzie didn't plan on becoming a potter when he enrolled at the Chicago Art Institute in 1946, but was left with little choice when all the classes for painting were full. All of that is history because MacKenzie has made a huge name for himself as a master of functional pottery from the Midwest and beyond. He wants people to be able to afford his pieces even though some of them command high prices from collectors. He likes the everyday use of his pots-washing, being eaten or drunk from. It's that constant contact that makes his work special. He used to sell out of his studio showroom in Stillwater. Guests would use an honor system-paying the sticker price and leaving money in the wicker basket for the pots they took. He closed it down due to theft and people re-selling his work for outrageous prices online. Now you can buy his pots at the Northern Clay Center in Minneapolis. Ceramic artist Warren Mackenzie shapes clay into simple, functional pieces.